after a few days of procrastination, I finally got around to finishing this. Prints are now available for this painting. She reminds me of Hutsane Miku! You did her justice... FIELDS OF JUSTICE !! Do you sell prints of your work? I would love to buy a copy of this. if enough wants to buy prints, I can make them available. Please let me know if you do. We have a small collection of LoL art and I'd love to add this to it. This should have been the splash art, dayum. 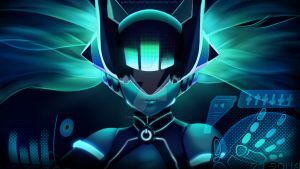 I like what you did with her mask and congrats on the riot dj sona fan arts! Wow, it looks so real! The shading is beautiful. Despite how her official look has her wearing masks, I like her eyes show through on this piece. She can poke like nobodies business! haha glad you noticed that you are 1 of 3 people mentioned that! WOW! that is a great looking sona!